ollowing up our pick for best wireless headphones, best noise cancelling headphones, and best headphones of 2017—Sony released a slightly-upgraded monster in the WH-1000XM3. Virtually identical to the model it replaces, incremental upgrades over the best isn't exactly a bad thing. For less than $200, it's not hard to understand why these are considered by many to be a classic pair of cans for audio producers and music lovers alike. The Plantronics BackBeat Go 810 is a great set of headphone for commuters. It provides active noise cancelling, a bass-heavy sound, and comfortable fit. Unfortunately, folding hinges are absent, so you'll need a bag. If you’re looking for an excellent pair of monitoring headphones and don’t want to drop a bunch of cash, these are a great pick. When it comes to listening to music, some of the best headphones you can get are over-ear headphones. Why? It all comes down to physics. In most cases the more space for sound to move around, the better they sound. Don’t get me wrong, there are some amazing pairs of in-ears out there, but because they’re such great feats of engineering, they also usually cost insane amounts of money for what you get. For the most part, over-ear headphones are easier to manufacture. Although they can get extremely expensive depending on the materials used, they’re usually a better value. Plus, the soundstage of a good pair of open-back headphones is something you won’t get in a pair of in-ears. When it comes to picking the best over-ear headphones there are a few different ways you can go about it. Are you looking for the best sound quality possible? Or do you want to ditch the wires and joins the Bluetooth revolution? There are literally thousands of over-ear headphones out there, some old and some new, and choosing between them can be overwhelming. Fortunately, we’ve done a ton of research and have plenty of hands-on experience with over-ears. To be fair, we’re keeping this in the range of what’s best for most people. If you consider yourself an audiophile who only wants the best, most expensive and extreme headphones then we have a few picks for you further down. Assuming you don’t have a listening setup at home with expensive equipment and just want a good pair of over-ear headphones to bring with you on your daily routine, then the Sony WH-1000X M3 should be on your shortlist. Editor’s note: this list was updated on March 21st, 2019, to include new picks and account for price changes. You may have heard about the Sony WH-1000X M2 if you were in the market for headphones at any point in 2017. They were one of the best headphones around and even dethroned the Bose QC35 as the best active noise cancelling headphones in our opinion. Now Sony has returned with a newer iteration dubbed the WH-1000X M3. While much remains the same, there are a few improvements that make the M3 a hair better than its predecessor. Regardless of which one you pick, though, both are compatible with Amazon Alexa. Let’s start with the build. Gone are the fake leather covers. The new model boasts a smooth plastic, giving the headphones a slightly more cohesive design. The ear cups are also deeper on the WH-1000XM3, which provides a more comfortable fit and improved isolation. Then there’s the touch-sensitive part of the ear cup itself which is completely unchanged. You’ll still be able to adjust volume, skip between tracks, and pause or play music just by swiping or tapping on the outside of the ear cup. Plus, external audio passthrough lets you your surroundings by cupping your hand over the ear cup. For most music, the WH-1000XM3 will be very bass-heavy unless you tune it down in the app. As you can see from our testing in the graph above, the Sony WH-1000X M3 doesn’t overemphasize any part of the frequency response. Instead, the headphones opt for a typical consumer-friendly sound with a slight emphasis on lows and mids. Battery life is also said to be 30-hours, though in our testing we got more like 24-hours of constant playback which is still impressive. You’ll have enough juice for a number of commutes, and no you can recharge them via USB-C instead of micro USB like the older WH-1000XM2. If you’re interested in seeing how they stack up against the Bose QC35 Series II, make sure to check out our full comparison. When it comes to open-back headphones, the Beyerdynamic DT 990 Pro headphones are easy to recommend. Not only because of how they sound, but because they’re a solid value when it comes to sound quality. Sure, not exactly cheap but still a great value for what you’re getting. One thing worth mentioning is these don’t have the same use case as the Sony headphones we mentioned above. If you’re going to be using your headphones on your commute, these are a hard pass. That said, if you want to elevate your listening experience at home, then these get the job done. As far as build quality is concerned, the DT 990 Pro over-ear headphones are made almost entirely of plastic and don’t fold, or have rotating ear cups. Again, not something you want to throw in your bag on your way to work. Instead, these are made to be used at your desk or on your couch when you’re looking to relax. The padded velour ear cups feel great and are comfortable for long listening sessions. Not to mention the open-back design allows for a better soundstage than what you’ll find in most closed-back headphones. But nothing is perfect, and the one big caveat with these is that the wire is non-removable and has an impedance of 250Ω. So if you want to properly drive these you’re going to also need an amp to provide the extra juice needed, or just rely on any of the best sounding smartphones to drive them for you. Another pair of open-back headphones that we couldn’t leave off of this list is the Monoprice Monolith M1060 planar magnetic headphones. Monoprice is no stranger to making high-quality products at low prices whether that’s in the form of headphones or USB cables. So when the company announced a pair of planar magnetic headphones, we had to check it out, and they didn’t disappoint. But let’s get one of the biggest cons out of the way right now: these are heavy. They weigh about 500 grams and are made almost exclusively of metal and wood. Inside each giant ear cup is a 106mm planar magnetic driver. That’s more than double the size of the 40mm drivers you’ll find in the Sony headphones we mentioned earlier. So, yeah, they’re big. You can read more about how this affected the sound quality by reading the full review, but chances are you won’t be upset if you splurge and pick up a pair of these for yourself. Of course, like the DT 990 Pro we mentioned above, these are also open-back headphones designed to be used in a controlled environment. Because there’s nothing separating the drivers from the outside. This means everyone around you can hear what you’re listening to and, even worse, you’ll hear them too. These headphones have a removable cable that ends in a 3.5mm jack on one end, and two 2.5mm connectors on the other. Plantronics’ go at wireless over-ear headphones is commendable. Sure, there are a few quirks and the lack of folding hinges is aggravating, but noise cancelling is a must-have for any commute and these are less than half of what the Sony WH1000XM3 cans cost. What’s more, if you’re looking for headphones with a bumping bass response, this is it. While the Beats house sound shakes the skull a bit more, this low-end emphasis is more palatable. Unfortunately, portable over-ear headphones seems an oxymoron, but you can either throw them in a bag or leave them around your neck when not in use. One of the most useful features of these headphones is their intuitive control panel, which resembles that found on the Plantronics BackBeat Fit 500. This means you spend less time fumbling around with your phone and potentially dropping it on the unsavory subway car floor. Until we get our hands on the Audio-Technica ATH-M50X Bluetooth edition, which features folding hinges and movable ear cups, the BackBeat Go 810 is a fine option for commuters. These are all great, but what if you’re not looking to spend so much money? In that case, it’s easy to recommend the Audio-Technica ATH-M40X. The ATH-M50X headphones are basically internet famous, but they also have more emphasis on the low-end, so if you want exaggerated bass, check those out. Otherwise, the ATH-M40X is the way to go. The foldable, slim design won’t attract too much attention when out in public. At the same time, though, the closed-back design makes these great for using in public as they passively block outside noise. Not as good as a pair of active noise cancelling headphones, but good enough. Even though the audio cable is removable, one of the downsides is that they’re proprietary cables made by Audio-Technica. So if you lose one or it breaks, you’ll have to order the replacement from the company. On the bright side, you’re afforded two cables from the start: one straight 1.2-meter cable for when you’re on-the-go, and a 3-meter coiled cable for a desk or in a studio. The ATH-M40X is a great option for most people, especially since it won’t break the bank when you pick up a pair. We told you there would be a section for all you audiophiles out there, and here it is. If you just want the best you can get, check these out. Sennheiser HD820: We got to check out one of the newest offerings from Sennheiser at CES and even though we haven’t yet got it in-house for a full review, it really impressed us. So while we didn’t recommend these because we haven’t reviewed them yet, it’s safe to say that if you have the money, these are one of the best you can get right now. Sennheiser HD600: If you think spending that much money on headphones is ridiculous, no one is going to blame you. Which is why the HD 600 headphones are another solid option from Sennheiser for way, way less money. Focal Utopia: We actually got a chance to review the Focal Utopia headphones and, wow, they’re good. But as great as they are, they’re crazy expensive which is why we can’t recommend them to the average person. That said if you have the money to blow, go crazy. Bose QC35 II: Before the WH-1000X M2 headphones came around, there were the Bose QC 35 headphones. Just because these have been dethroned as “the best” active noise cancelling headphones, doesn’t mean they’re not still great. Beyerdynamic Amiron Wireless: These are worth checking out if for nothing other than the great sound quality. 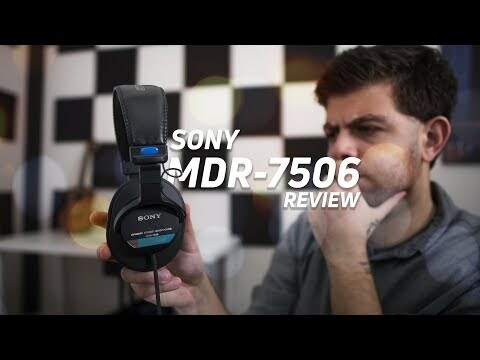 Sony MDR-7506: If all of these options are way too expensive, then go with the Sony MDR-7506 headphones. These are far from new, but they’re still an industry standard when it comes to audio production. Sennheiser HD 58x Jubilee: These large, open-back, over-ear headphones are a Massdrop exclusive and feature an ever-so-slight emphasis in bass reproduction. Focal Listen Wireless: Despite the bulky size, these headphones are comfortable to wear for long periods at a time and are excellent at passive noise isolation. HiFiMan Edition S: Convertible headphones are a rare breed, and these are the best of them. The magnetic plates are removable and allow for open-back listening when at home. They can be re-attached for public listening, but external noise still seeps in. Anker Soundcore Vortex: The Anker Soundcore Vortex supports aptX and features a comfortable, albeit generic, build. The sub-$50 price tag, however, is the most attractive feature. If you’re not looking to spend too much, don’t forget to check out some of our other lists which include headphones at more affordable price points. If you frequent enough audio sites you’ll see people talking about something called isolation. If you want to know exactly how this affects your music, you can read all about it here. But if you’re short on time, we’ll break it down here. Isolation refers to the ability of your headphones to block outside noise from reaching your ears. This might sound like active noise cancellation, but it isn’t. Active noise canceling uses microphones to pick up the sounds that are going on around you and then produces the inverse sound wave in order to cancel it out. In physics, it’s called destructive interference and you can learn more about that here, but that isn’t what isolation is. Isolation affects both sound quality and bass response; if you can’t get a good seal, both of those things are heavily degraded. Isolation doesn’t use microphones to block outside noise, instead, it does so by simply being a physical barrier between your ears and the outside noises. Every time you stuff your fingers in your ears, you’re isolating yourself. You can still hear certain loud noises going on around you, but for the most part, sounds are blocked out. A good pair of over-ear headphones can do something similar. They’ll cover your ears and block noises that would otherwise interfere with the music you’re listening to. Do you need an amp/DAC? Whether you need a DAC or an amp is something that varies from headphone to headphone. It’s not universally true that your headphones will sound better if you have the best DAC and amp setup. It depends on a few different things. But when it comes to whether or not you need a DAC the short answer is no. Unless your source device is really old, the DAC inside should be good enough to handle whatever it is you’re listening to. Especially if your main way of consuming music is through streaming services. With most modern headphones, a DAC is unnecessary; amps, however, are still relevant depending on your headphones. As far as an amp is concerned we’d usually say no as well. Most headphones don’t need a huge amount of power to drive them, and you’ll be fine with even a mid-range smartphone. But this list has some of the best over-ear headphones around, and a few of them do require a good amount of power if you want to get the most out of them. So if you’re looking into getting the Beyerdynamic DT 990 Pro or the Monoprice Monolith M1060 headphones, it might be a good idea to pick up a decent amp. Now don’t be fooled by the audio-related nonsense you see on forums. If you read our piece on amps, figuring out how powerful of an amp you need is nothing but a simple math problem. But we’ll do you one better. If you think you’re going to need an amp, just pick up the Fiio E10K DAC/amp combo. Whenever you’re talking about speakers or headphones one thing you hear brought up a lot is the frequency response. But what is it exactly? Turns out it’s pretty important and Rob Triggs from our sister site Android Authority wrote a great article explaining exactly what it is. But we’ll keep it simple here. Frequency response relates to how well a particular pair of headphones and its components are able to reproduce a note. A comparison of an ideal flat (green), acceptable real-world example (yellow), and audible (red) frequency responses. I’m going to use a completely unrelated analogy that I think gets the point across nicely. Think about a water hose. When you turn on the water, it slowly trickles out of the end. But then if you add a nozzle, you can rotate between settings to make a jet stream, or a shower, or even mist. It’s the same concept as your headphones. The audio coming from your source device is the water. Left to its own devices, it’ll just flow right on through to the other side. Your headphones are like the nozzle. It influences how the water flows because of how it’s made. In the same way, the circuitry in your headphones influences how the audio data is transferred. If it doesn’t emphasize any particular notes, those can be considered reference headphones because they let you hear the audio as it is. But that’s not how most consumer headphones work. Turns out, plenty of people like a good amount of bass (just look at Beats). So consumer headphones will add some emphasis to lower notes, like the nozzle on your water hose. Do you need to burn-in your over-ear headphones? No. That’s all that it warrants here, but make sure to read why that myth is busted here. What should you know about Bluetooth? You may have noticed that there are a good amount of Bluetooth headphones on this list, which means that you might want to familiarize yourself with how it works before making a decision. First, let’s get one thing out of the way. No, it isn’t. While it’s true that science is always learning more and humans don’t know everything about everything, that doesn’t mean we know nothing. We actually know quite a bit, and while ignorance in a certain topic is a powerful motivator to continue experimenting, it doesn’t negate what we’ve already learned. You can go deep into this topic by reading our full explainer here, but it comes down to one simple concept. Ionization. If you can think back to your science classes, exposing atoms to high amounts of energy will knock off electrons and create ions, or charged particles. This isn’t good when it happens to the DNA in your cells, which is why gamma rays and X-rays can be so harmful to humans. Those are high energy waves that can do some serious damage. Luckily for us, Bluetooth, Wi-Fi, and radio waves fall on the other side of the spectrum into a category called non-ionizing radiation, which means that they can’t knock electrons off of the bases in your DNA. They’re simply not powerful enough. Do you know what is significantly more dangerous to your skin? Tanning beds, but there are plenty of those around. Again, you can read deeper into this by clicking here, but anyone that says your phone is going to give you cancer is just trying to scare you. If you don’t feel like reading any more don’t worry, we also have an entire podcast episode dedicated to just this topic. Does it have the same sound quality as wired headphones? Nope. While Bluetooth has become way better and more convenient in the last few years it still can’t compete on a technical level with wired over-ear headphones. Sure, we might be a little biased against removing the headphone jack, but even our objective testing of the LDAC codec (which is arguably one of the top transfer methods currently available) revealed that Bluetooth falls short. Of course, you probably won’t have to worry about it too much if you’re over the age of 24 because our hearing tends to go a lot sooner than you might realize, but it’s still something you should be aware of. At least for now, wired headphones still reign supreme. The PX Wireless fits well but can get heavy after a few hours. When it comes to over-ear headphones, people tend to get defensive. The problem is that over-ear headphones aren’t like your typical gadget. They’re more like hammers. I’m assuming a hammer from 20 years ago is probably just as good as a hammer you’ll get now. Admittedly, I’m not exactly a hammer aficionado; however, just because a product is newer doesn’t make it better. So instead, we broke it down into a few different categories that we think most people shopping for over-ears will care most about. We have an entire section of our site dedicated to learning about audio, but a list like this is for someone who is thinking about buying a pair. Which is why for most people, we think the Sony WH1000XM3 headphones will be a good match. People who are new to headphones will get one of the coolest and best sounding Bluetooth headphones on the market, and hopefully, die-hard audiophiles will find something that they wouldn’t have normally tried. Just ask our executive editor Chris who has a personal vendetta against all things Bluetooth, but still found himself loving the WH-1000XM2 and WH-1000XM3. Chris boasts countless hours testing consumer audio products over many years. Then we figured if you don’t want Bluetooth and still want over-ears, you’re prioritizing sound quality. In that case, it’s hard to beat open-back over-ear headphones. Then for the bang for your buck pick, we wanted a pair of headphones that were respected but not cheap. No one is going to tell you that the ATH-M40X over-ear headphones are the greatest headphones ever made, but at the price point, they offer a wide range of use cases that everyone from a young kid to a businessman can appreciate. Not only is this site our nine-to-five, but Adam, Chris, and Lily each have multiple years of reviewing consumer audio products. We’ve kept tabs on the ever-changing world of audio, giving us the ability to parse apart the gimmicks from the gems. Plus, we’re using Chris’s brain power to come up with numerous ways of testing products to give you objective data that isn’t confusing, but useful. Adam, a SoundGuy for nearly three years, has heard everything from pristine highs to vacant lows. Then there’s Lily with countless hours clocked in at a radio station working in a professional studio environment and reviewing audio products on her own time prior to joining SoundGuys. Also, he just has fun doing this. Head shaking sends the Beyerdynamic Amiron Wireless over-ear headphones flying off.